What’s this about Google Not Showing Featured Snippet Date in GSC? In this free thought-piece, you can read actionable insights into the reasons for Google not surfacing Featured Snippet Data in Google Search Console. If you would like to discuss ways to see this data, and whether you should be targeting Featured Snippets in the first place, please feel free to contact me. 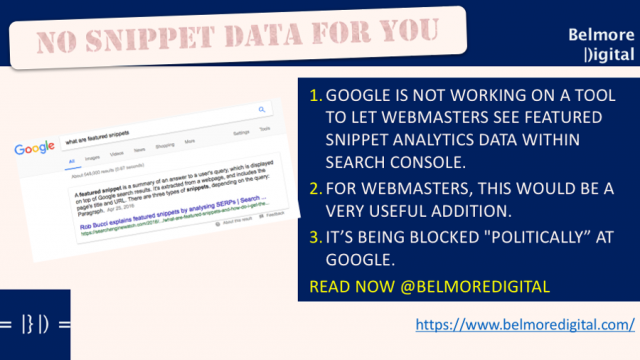 Google is not working on a tool to let webmasters see Featured Snippet analytics data within Search Console. This is despite testing such a feature nearly a year ago, and for webmasters, this would be a very useful addition. This is being blocked “politically” as the Google higher-ups can;t see how it would help publishers make better content. For the foreseeable future, the only way to get a handle on what queries you get a Featured Snippets for is through one of the SEO Tools. Use those tools to analyse which of your pages generate a Featured Snippet. Use competitor insights to spot which queries generate Featured Snippets and analyse the elements of those pages to see what their “secrets”** are. Build content like those pages and wait for the glory of Featured Snippets to be awarded. Note that several recent studies have shown that for queries with Featured Snippets, organic traffic to pages in those listings is suppressed, so creating them is a little bit like shooting oneself in the foot. Contact me if you would like to discuss ways to structure content to give yourself a better chance of generating Featured Snippets. *Slaps forehead*. Google wants Featured Snippets, as it wants to take a click out of the search chain and stop users from having to visit a yucky old-school website. It would seem sensible if Google gave out a bit of information to webmasters to encourage them to structure their content so it might appear as a Featured Snippet. But, no. Obviously, if Google displays that information, then it is a little bit open to being gamed, but still the honest practitioners would outweigh the spammers and gamers, in most instances. (And unless you can drive the onward click, there really is little point in gaming this one). The use case Google mentions is clear: give webmasters information about what pages generate Featured Snippets for what queries, and you are more likely to get more pages which are suitable structured to generate Featured Snippets. Read The State of SEO in mid-2017. It’s essential. There’ll be no Featured Snippet Data in Google Search Console anytime soon. This is despite there being a potential huge content upside to Google. There’ still doubt whether you *should* be targeting surfacing as a Featured Snippet.